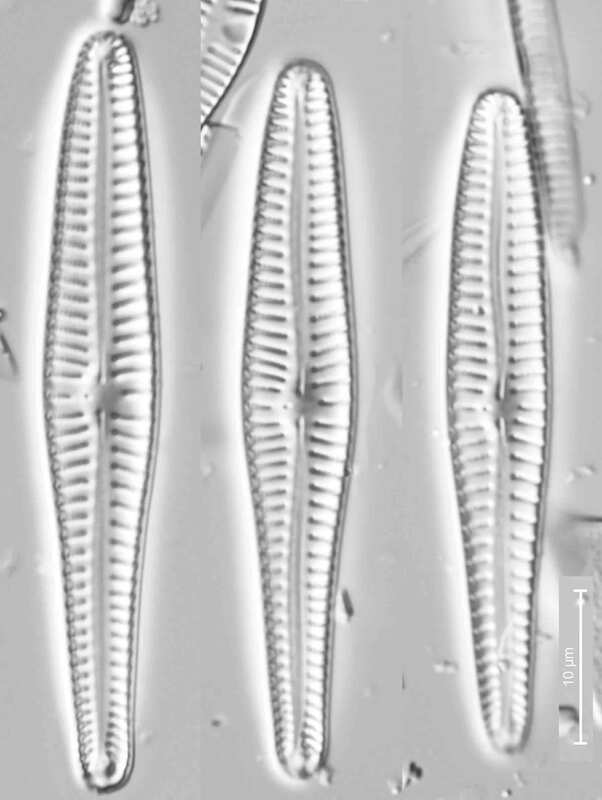 I promised to write a little more about Gomphonema subclavatum, one of the diatoms we encountered in the previous post. I picked this one out for more attention because it is one of many diatoms that have changed names in recent years and it is sometimes interesting to scratch around to understand why this has happened. Had I seen this particular species fifteen years ago I would have called it Gomphonema clavatum without hesitation. Although G. subclavatum was recognised as a distinct species back in the nineteenth century, for most of the twentieth century it was treated as a variety of G. longiceps, which Krammer and Lange-Bertalot then subsumed into G. clavatum. If you look at their plate of G. clavatum, you will see a huge range of sizes and shapes so it is perhaps no surprise that people subsequently realised that there was more than one species lurking under this name. Gomphonema subclavatum from Cregduff spring, Co. Mayo, Ireland, September 2017. Photographs: Bryan Kennedy. Scale bar: 10 micrometres ( = 100th of a millimetre). When this happens, taxonomists ask which of the various contenders was the Gomphonema clavatum seen by the person who originally described the species. This involves going back to the museum collection where that person deposited the material that they examined and taking another look. This process of “typification” helps determine which of the forms is the rightful inheritor of the name. Erwin Reichardt decided to have a go at this process for G. clavatum and went to examine the samples, now in the Museum für Naturkunde in Berlin, on which Christian Gottfreid Ehrenberg had based his original description. However, he could find nothing that resembled G. clavatum, with the closest match being G. olivaceum. I’m reading a biography at the moment that contains the warning that “history is always a matter of trying to think into the minds of people who think differently from ourselves”. That serves as a useful reminder that Ehrenberg knew far less about the biology of diatoms than we do today, but was also limited by the technology available. Not only were his microscopes far less sophisticated than ours but also capturing the essence of the organisms he saw in print was far from straightforward (see “Picture this?”). The idea of Gomphonema clavatum that we had until Reichardt re-examined the type material was the result of a 180-year game of “Chinese whispers”: each generation matching their specimens to inadequate images and descriptions, then making their own images which, in turn, became the basis for their successor’s identifications. By the time Krammer and Lange-Bertalot wrote their Flora, it was finally possible to reproduce high quality micrographs, rather than line drawings but over a century of taxonomic drift meant that their images are no longer connected to the right name. Their plate actually shows two species: the larger forms with undulate margins belong to G. longiceps Ehrenberg 1854) whilst the smaller specimens are G. subclavatum. That assumes, of course, that there are no further twists to come. As I alluded in my previous post, morphology might not be telling us the whole story for this genus. Krammer, K. & Lange-Bertalot, H. (1986). Süsswasserflora von Mitteleuropa. 2/1 Bacillariophyceae 1: Naviculaceae. Spektrum Akademischer Verlag, Heidelberg. Reichardt, E. (2015). The identity of Gomphonema clavatum Ehrenberg (Bacillariophyceae) and typification of five species of the genus Gomphonema described by C.G. Ehrenberg. Diatom Research 30: 141-149. The biography to which I refer is Tom Wright’s new book on Paul (SPCK, 2018). This entry was posted in diatoms and tagged diatoms, Gomphonema, taxonomy. Bookmark the permalink.